LSU got a supposed early jump on the coaching carousel this season with an in-seaosn firing of Les Miles. The day Miles was fired, Florida State head coach Jimbo Fisher immediately began to be linked to the Tigers as their top choice. As the leaders in place at the university charged with finding the next head coach are reportedly coming close to making a decision, Fisher still remains one of the top names on the short list. Interim head coach Ed Orgeron also remains in the running, according to The Advocate’s breakdown of the latest coaching developments at LSU, although a loss over the weekend against Florida may have hurt his chances. Consider how much LSU was looking to win that game against the Gators after all the off-field drama of rescheduling the game, and you can imagine the stock in a win in that specific game may have been pretty high. Instead, Florida came into Baton Rouge and walked out as SEC East champions. Fisher has never wavered from his position as Florida State head coach, saying all the things you expect a coach already in place at another university to say. But The Advocate reports LSU has “kept the lines of communication open with Jimbo Fisher’s people.” Noted agent Jimmy Sexton is Jimbo Fisher’s people, and if there is one thing Sexton does extremely well, it is get his clients paid. It is possible Sexton is using LSU’s vacancy as a way to lead to a contract upgrade at Florida State. That’s what agents do. But there is a chance Fisher to LSU could be a realistic possibility. It makes sense, given Fisher’s success and track record and the fact he once coached at LSU under Nick Saban. He would be a natural fit. 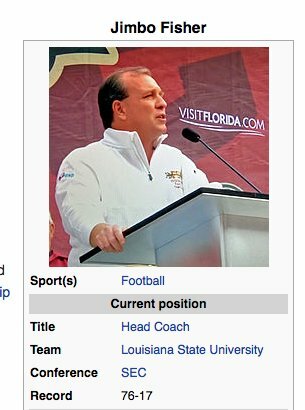 Naturally, Wikipedia already made the coaching change official. LSU is prepared to offer a big contract to whoever becomes the next head coach, as funds are readily available. And if it is not Fisher, it could very well be Houston head coach Tom Herman, who has become the talk of the coaching carousel once again after coaching Houston to a second win against the top five team this season following last Thursday’s victory over Louisville. Or it could be Orgeron, a popular coach with the players and fans. Who else should be considered in the running? The Advocate reports Larry Fedora (UNC), Justin Fuente (Virginia Tech), Mike Gundy (Oklahoma State), Dana Holgorsen (West Virginia), and Mike MacIntyre (Colorado) could possibly be targeted by the Tigers. LSU may also want to make their coaching hire official as quickly as possible, because Texas could be ready to start browsing the market as well, not to mention Baylor and Purdue are already looking, and others will be joining shortly once the season wraps up. Somebody is going to be paid handsomely by LSU, and we may find out pretty soon just who it may be.